Because of the pope's attack on the Rule of Saint Francis, William of Ockham, Michael of Cesena and other leading Franciscans fled Avignon on 26 May 1328, and eventually took refuge in the court of the Holy Roman Emperor Louis IV of Bavaria, who was also engaged in dispute with the papacy, and became William's patron. After studying the works of John XXII and previous papal statements, William agreed with the Minister General. In return for protection and patronage William wrote treatises that argued for emperor Louis to have supreme control over church and state in the Holy Roman Empire. "On June 6, 1328, William was officially excommunicated for leaving Avignon without permission," and William argued that John XXII was a heretic for attacking the doctrine of Apostolic poverty and the Rule of Saint Francis, which had been endorsed by previous popes. William of Ockham's philosophy was never officially condemned as heretical. 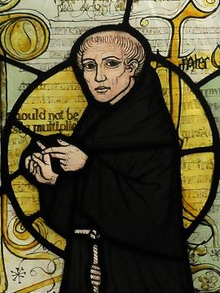 William of Ockham was a pioneer of nominalism, and some consider him the father of modern epistemology, because of his strongly argued position that only individuals exist, rather than supra-individual universals, essences, or forms, and that universals are the products of abstraction from individuals by the human mind and have no extra-mental existence. He denied the real existence of metaphysical universals and advocated the reduction of ontology. William of Ockham is sometimes considered an advocate of conceptualism rather than nominalism, for whereas nominalists held that universals were merely names, i.e. words rather than extant realities, conceptualists held that they were mental concepts, i.e. the names were names of concepts, which do exist, although only in the mind. Therefore, the universal concept has for its object, not a reality existing in the world outside us, but an internal representation which is a product of the understanding itself and which "supposes" in the mind the things to which the mind attributes it; that is, it holds, for the time being, the place of the things which it represents. It is the term of the reflective act of the mind. Hence the universal is not a mere word, as Roscelin taught, nor a sermo, as Peter Abelard held, namely the word as used in the sentence, but the mental substitute for real things, and the term of the reflective process. For this reason William has sometimes also been called a "terminist", to distinguish him from a nominalist or a conceptualist. Expositio in libros Physicorum Aristotelis. Prologus et Libri I–III (Exposition of Aristotle's Physics) (1322–24, OP 4). Expositio in libros Physicorum Aristotelis. Prologus et Libri IV–VIII (Exposition of Aristotle's Physics) (1322–24, OP 5). William of Occam served as an inspiration for the creation of William of Baskerville, the main character of Umberto Eco's novel The Name of the Rose. William of Occam is the main character of La abadía del crimen, a video game based upon Umberto Eco's The Name of the Rose. ^ Spade, Paul Vincent (ed.). The Cambridge Companion to Ockham. Cambridge University Press, 1999, p. 18. ^ a b Spade, Paul Vincent (ed.). The Cambridge Companion to Ockham. Cambridge University Press, 1999, p. 20. ^ a b He has long been claimed as a Merton alumnus, but there is no contemporary evidence to support this claim and as a Franciscan, he would have been ineligible for fellowships at Merton (see G. H. Martin and J. R. L. Highfield, A History of Merton College, Oxford: Oxford University Press, 1997, p. 53). The claim that he was a pupil of Duns Scotus at Oxford is also disputed (see Philip Hughes, History of the Church: Volume 3: The Revolt Against The Church: Aquinas To Luther, Sheed and Ward, 1979, p. 119 n. 2). ^ Summa Logicae (c. 1323), Prefatory Letter, as translated by Paul Vincent Spade (1995). ^ Jortin, John. Remarks on Ecclesiastical History, Volume 3. p. 371. ^ Johann Jacob Hofmann. Lexicon universale, historiam sacram et profanam omnis aevi omniumque... p. 431. ^ There are claims also that he was born in Ockham, Yorkshire but it is now accepted that his birth place was in Surrey. See Wood, Rega (1997). Ockham on the Virtues. Purdue University Press. pp. 3, 6–7n1. ISBN 978-1-55753-097-4. ^ "Holy Days". Liturgical Calendar. Church of England. Retrieved 12 May 2013. ^ a b The Oxford Companion to English Literature, 6th Edition. Edited by Margaret Drabble, Oxford University Press, 2000, p. 735. ^ During that time (1312–1317) Henry Harclay was the Chancellor of Oxford and it is believed that William was his pupil (see John Marenbon (ed. ), Medieval Philosophy, Routledge, 2003, p. 329). ^ a b c d e Spade, Paul Vincent. "William of Ockham". Stanford Encyclopedia of Philosophy. Stanford University. Retrieved 22 October 2006. ^ Brundage, James (2008). "Canon Law in the Law schools". The history of medieval canon law in the classical period. Catholic University of America Press (Wilfried Hartmann & Kenneth Pennington, eds.). p. 115. ISBN 0813214912. ^ Knysh, George (1986). "Biographical rectifications concerning William's Avignon period". Franciscan Studies. 46: 61–91. doi:10.1353/frc.1986.0020. JSTOR 41975065. ^ Hundersmarck, Lawrence (1992). Great Thinkers of the Western World. Harper Collins. pp. 123–128. ISBN 0-06-270026-X. ^ "William of Occam". wotug.org. ^ Gál, Gedeon (1982). "William of Ockham Died 'Impenitent' in April 1347". Franciscan Studies. 42: 90–95. doi:10.1353/frc.1982.0011. JSTOR 41974990. ^ "William of Ockham". Arizona State University. Retrieved 4 February 2019. ^ Lucan Freeport, Basis of Morality According to William Ockham, ISBN 0819909181, ISBN 9780819909183, Franciscan Herald Press, 1988. ^ a b One or more of the preceding sentences incorporates text from a publication now in the public domain: William Turner (1913). "William of Ockham" . In Herbermann, Charles (ed.). Catholic Encyclopedia. New York: Robert Appleton. ^ Stanley J. Grenz. The Named God and the Question of Being: A Trinitarian Theo-Ontology. ^ W. M. Thorburn (1918). "The Myth of Occam's Razor". Mind. 27 (107): 345–353. doi:10.1093/mind/XXVII.3.345. Retrieved 25 October 2006. ^ Spade, Paul Vincent (ed.). The Cambridge Companion to Ockham. Cambridge University Press, 1999, p. 104. ^ André Goddu, The Physics of William of Ockham, ISBN 9004069127, ISBN 9789004069121, Brill Academic Pub., 1984. ^ Brower-Toland, S (2014). "William ockham on the scope and limits of consciousness". Vivarium. 52 (3–4): 197–219. doi:10.1163/15685349-12341275. ^ "British Academy – William of Ockham: Dialogus". www.britac.ac.uk. ^ Takashi Shogimen, Ockham and Political Discourse in the Late Middle Ages [1 ed. ], ISBN 0521845815, ISBN 9780521845816, Cambridge University Press, 2007. ^ a b c d Virpi Mäkinen, Keskiajan aatehistoria, Atena Kustannus Oy, Jyväskylä, 2003, ISBN 9517963106, ISBN 9789517963107. Pages 160, 167–168, 202, 204, 207–209. ^ Priest, Graham; Read, S. (1977). "The Formalization of Ockham's Theory of Supposition". Mind. LXXXVI (341): 109–113. doi:10.1093/mind/LXXXVI.341.109. ^ Corcoran, John; Swiniarski, John (1978). "Logical Structures of Ockham's Theory of Supposition". Franciscan Studies. 38: 161–83. doi:10.1353/frc.1978.0010. JSTOR 41975391. ^ John Corcoran (1981). "Ockham's Syllogistic Semantics", Journal of Symbolic Logic, 46: 197–198. ^ William H. Watts and Richard J. Utz, "Nominalist Influence on Chaucer's Poetry: A Bibliographical Essay," Medievalia & Humanistica 20 n.s. (1993), 147–73; Helen Ruth Andretta, Chaucer's 'Troilus and Criseyde.' A Poet's Response to Ockhamism (New York: Lang, 1997); Richard Utz, ed., Literary Nominalism and the Theory of Rereading Late Medieval Texts: A New Research Paradigm. Lewiston, NY: Mellen, 1995; Nominalism and Literary Discourse: New Perspectives. Ed. Hugo Keiper, R. Utz, and Christoph Bode. Amsterdam: Rodopi, 1997.